The colors are true to the picture. It is a beautiful rug. I have bought several of these for various areas in my home, and I really love how they feel underfoot and how vibrant the colors are. I wouldn't hesitate to purchase another one when the need arises. 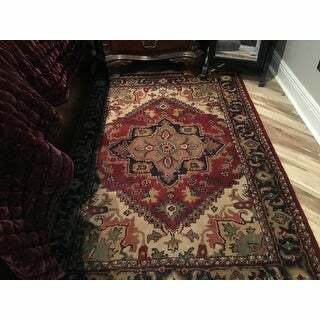 An intricate Oriental design and a dense, thick pile highlight this handmade Heritage rug. 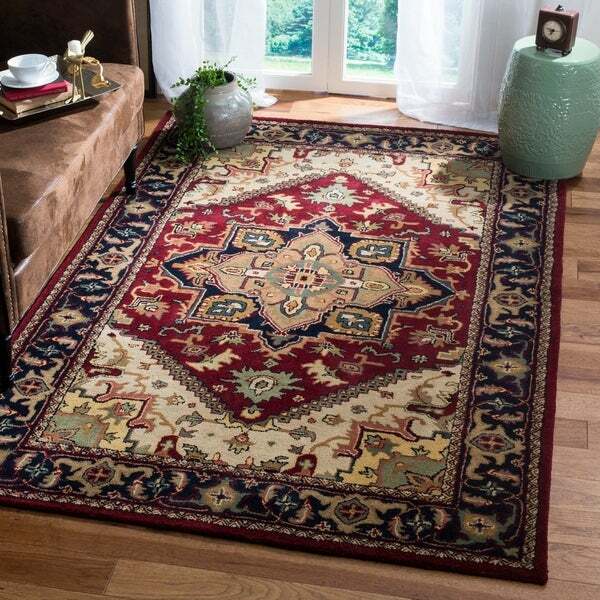 This floor rug has a red background and a navy border and displays stunning panel colors of gold, sage, blue and rust. The genuine wool of this traditional rug resists fading and holds up well to daily foot traffic, feeling soft and thick beneath bare feet even after years of use. 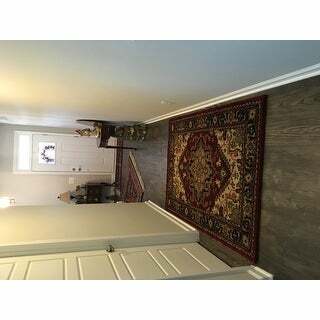 Place this rug in your hallway to muffle footsteps on hardwood floors, or use it as an accent piece in a smaller room. I love the colors of this rug and the fact that it is a good quality wool rug. To top it all off the price is very reasonable for a wool rug. I now own three wool rugs from the Safavieh Company. I would highly recommend this company anyone that is on a budget and enjoys good quality. This rug is so well made and blends perfectly with my 20 year old rugs which were five times the price of my new Safavieh Heriz Rug. Thank you Overstock.com! Rug is just as pictured and of great quality. However, the red is more burgundy and the black is actually navy. Nice thick wool. We read the reviews on the rug before we purchased it and we were a bit concerned about one write up regarding the colors. The review stated the maroon was more red that maroon. I would have to disagree. The colors are deep and rich, the maroon is definitely maroon. The pile is thick and lush. Great product for a great price. Great quality and perfectly soft. A beautiful, good-quality rug. Colors are even better than shown - the red is a rich, jewel-tone ruby color, and what looks beige in the photo is more like a pale gold or champagne color. Thick wool means it will last for years. Very happy with this rug! Beautiful rug. Great price for the quality. Bought two other rugs in the Heriz red/navy family. Love the dark Navy color. Dense and plush rug for the price. Definitely recommend. So nice, great size, cushy!! Just recieved this rug, and we are very pleased with the colors, and quality. The colors and pattern are strong, not muted, but balanced so that it is not over bearing for the entrance. Rather classy, I'd say. As an added not to this rug....there is a label on the back which states, Handmade in India. No children were used in the making of the rug. I appreciated that note. The colors on the screen in no way resemble the colors in the rug itself. I don't mind dark colors - most of my rugs are red & black. But the colors here are murky and dreary - not crisp or clean. The background cream in the picture is a dark, murky grey brown and the lighter blue shown is really an indistinguishable color. The detail in the picture is lost in real life. The pile is soft and thick so nice to walk on. I will keep it as a winter shoe hang-out so my other rugs don't get dirty. The rug is inexpensive so not worth the postage returning it. And if it gets trashed, who cares? After two tries and two returns, I finally got the rug I love on the third try. Third try is the charm, or three strikes you are out. The first rug was not a navy blue. The second one was too burgundy. The one I have now is red and navy. It looks great in my guest room! Love the rug and it’s colors! It fit my room exactly and goes with my furniture. Love the thickness and that it’s wool! Love it! It came as a bit of a different shade of blue but, I was able to use it in my hallway. This rugs is absolutely stunningly beautiful. Thick and the colors are so serene. This rug looks very expensive! Rich colors and the carpet is nice and thick. It also came sooner than expected. The colors in this beautiful rug are so rich, and the quality can't be beat. I can't believe I got such a wonderful rug at such a great price! Beautiful addition for our living room. Wonderful quality rug and I like the colors. It's thick, well made and soft to walk on. I'm thinking of buying another one. "This will rug lists at top RED AND NAVY. Down below in description it lists black and rust. I would like to know the true colors. I need black not navy. Thank you." "As a rule, can these hand tufted, cotton backed wool rugs be cleaned professionally as a hand made oriental rug would be, with water and blocking?" This item can be spot cleaned or professionally cleaned as well. "can this be machine washed?" Hello mbillx, this rug should not be machine washed. For liquid spills, use a clean, undyed cloth and press firmly around the spill to absorb as much as possible. For hard to remove stains, professional rug cleaning is recommended. Thanks for shopping with us! It is the perfect size and well priced oriental rug for my dorm room at university. 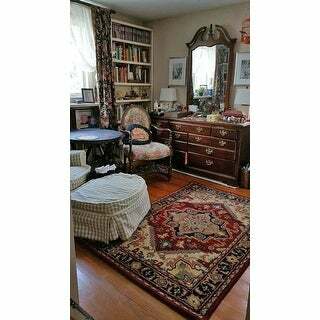 I want a colorful oriental type area rug for my small formal living room. I already have several different sizes of this rug and love the colors and texture. This product is not yet released, and is expected to ship on Oct. 31, 2005. Hand-hooked Wool Rust/ Navy Traditional Medallion Rug - 3'6" x 5'6"
Safavieh Handmade Heritage Traditional Heriz Red/ Navy Wool Rug - 9'-6" X 13'-6"